Today, I'm pleased to host this guest post by Sarah Smith, not least because I know how important it is to have a will if you are a disability parent, but also if you care for an elder. Everyone needs a will. Sarah is a small business owner, and is currently learning about marketing, using the internet. Aside from working on her own business, she likes to use social media, and read travel books. Everyone should have a will whether it's parents of a child with disabilities, homeowners or the elderly who might need help with the process. People without significant assets still need a will if they'd like to distribute their possessions to certain family members. In some cases, the creation of a will might require wills and estates lawyers if it's a complicated process. For a few dollars, it's possible to create a will online with the help of software and a last will and testament form. It'll help you fill in the blanks and walk you through a questionnaire to figure out how to distribute your money and belongings. The will can also cover who will take the children in the event both parents pass away in an accident. It can cover retirement accounts too. Consider the items you'd like to give to certain family members or items that you'd like to donate to charity. You don't have to have millions of dollars to distribute among heirs. If you'd like your nephew or granddaughter to receive certain items after your death, your will can detail those precise distributions even if you make a will online. Most of your jointly-held assets will automatically revert to the spouse, but with some couples not being married, it can get slightly more complicated. If one person owns the house, that house may go to the next of kin, which could put the significant other in a precarious position. A will helps to make these kinds of arrangements clear after you are deceased. Along with the heirs to your money and property, you can choose an executor of your estate for heirs that are under 18 years old. When you are leaving money to a child, that child will have a guardian. You will likely be leaving the child with a relative or other trusted person after you pass, and that will be detailed in your will. You can assign this person as executor of your child's estate too. This lets them access money for the care of the child. It might also hold money back from the child until they hit a certain age. When it comes to making a will legal, you have to print it out and have it signed by a witness. Most wills require two witnesses or a notary public who will verify that it was you signing the will. It's better to have a separate party who isn't receiving any money or assets sign as a witness to your will. It's less complicated. 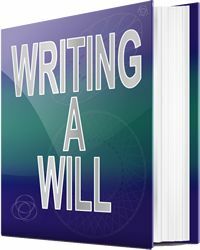 There are times when it makes more sense to hire a lawyer to help draft the will. A simple will online can be great for most people, but if you have a complicated situation you might need a lawyer. For example, the situation may involve stepchildren, children from previous marriages, assets like a family business and various pieces of property. With these complicated scenarios, a lawyer can navigate estate law to craft a will for you. Dying without a will means that state laws decide who will get all your assets. It could go to your spouse in most cases, which can be complicated if you have children from a previous marriage. The custody of the children can be up in the air until a judge makes a decision, and that person may not be ideal. It's important to be prepared and have a will even if that will is a simple one that you crafted yourself online. It'll allow you to designate your heirs and distribute your money and property. It'll also dictate custody of your children instead of letting the state decide.